With the launch of the Pixelbook and Acer Chromebook Tab 10, Google has more or less officially confirmed the death of Android tablets. It appears Google is planning to replace Android tablets with Chrome OS devices that can run Android apps. Still, many OEMs like Samsung continue to make Android tablets as there is enough demand to make some profit. Earlier this year, a list of unannounced Samsung device codenames was found in the leaked Galaxy Note 8 Oreo firmware. One of the codenames in the list was gta2xl, which pointed to a Galaxy Tab A 10.1 (2018) model since the previous Tab A 10.1 model launched in 2016 carried the codename gtaxl. The same device has been now spotted on the Bluetooth certification website, more or less confirming its existence and imminent launch. The certification page lists the product name as Galaxy Tab A2 XL and model number as SM-T595. 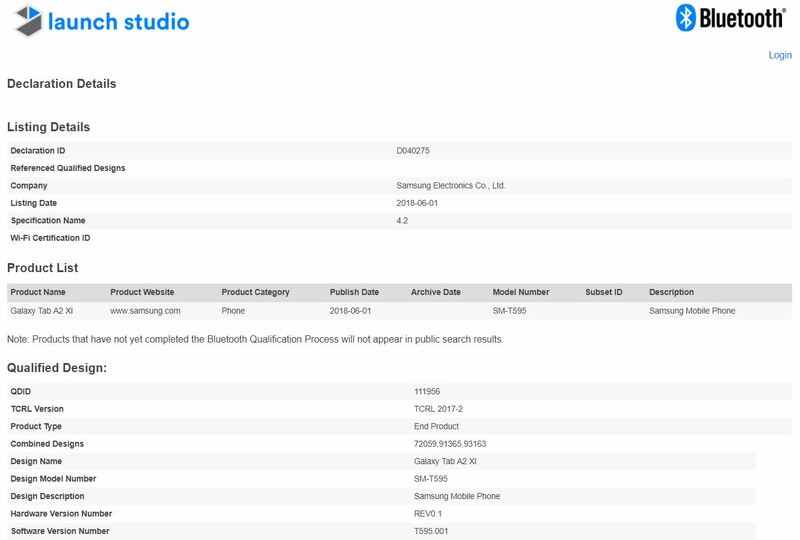 Since the previous Galaxy Tab A 10.1 carried the model numbers SM-T580 and SM-T585 for Wi-Fi and LTE variants respectively, the device spotted on the Bluetooth SIG website could be the LTE version of the Galaxy Tab A 10.1 successor. Not long ago, a device with the model number SM-T590, which could be the Wi-Fi-only version of the Galaxy Tab A2 XL, was also spotted on the Eurasian Economic Commission’s website. Currently, nothing else is known about these devices other than their model numbers and Bluetooth version. Since the predecessor is a mid-range tablet, the same could be the case of the successor as well. It is still not clear if the new tablet will launch as the Galaxy Tab 10.1 (2018) or as the Galaxy Tab A2 XL. Since devices undergo various certifications when they are about to hit the market, it is safe to assume the tablet will launch soon.